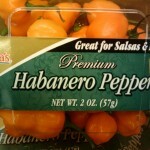 If you want to heat things up, use a Habenero Pepper. It is the hottest pepper in the world. It will spice up any recipe. So wash hands after handling this pepper . It can be used in sauces, marinades and seafood.